Liberty City Fire Department (LCFD) in Harwood, Portland in GTA III. The Fire Truck spawned in Liberty City in GTA 1, bearing no specific fire department marking. Whilst unnamed in Grand Theft Auto 1, the game's rendition of Liberty City spawns a Fire Truck model that is also shared with those appearing in Vice City. Obviously, its dual use in two different cities means the Fire Truck lacks any proper label designating the vehicle as belonging to any specific fire department (i.e. the "FDLC" initials), unlike the San Andreas Fire Truck, featuring only a "FIRE" label on the roof. As are other emergency services in the game, Liberty City's Fire Trucks only arrives at the scene of emergencies; specifically, where multiple vehicles are destroyed in explosions and are burning as a result. Like other emergency services in Liberty City, LCFD crews will arrive in a scene where fire from a player's Molotov cocktail or flamethrower, or burning wrecks are raging, attempting to put the flames out using their Fire Truck's powerful decked-mounted water cannon. Players can easily commandeer the LCFD's fire trucks to perform "Firefighter" side missions. Belleville Park, Staunton Island (GTA III). Francis International Airport, Shoreside Vale (GTA III). The Harwood fire station in GTA Liberty City Stories. 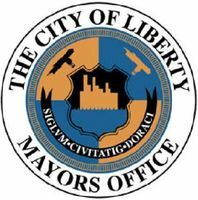 While the Fire Trucks and Downtown fire station in Vice City features a unique FDVC logo, the Escobar International Airport fire stations reuse the LCFD's logo, with the "LC" (Liberty City) initials merely substituted by "VC" (Vice City). In Grand Theft Auto: Liberty City Stories, there are two fire trucks located outside the Staunton Island station. After completion of the mission Karmageddon for Ned Burner, entering the fire truck to the left (the player see in the game) will trigger the Karmageddon side mission. Completion of this will unlock a Molotov Cocktail spawn behind the fire station. The FDLC in GTA III and GTA Liberty City Stories has several mottos, which can be spotted on the side of many firetrucks, these mottos include "Putting out since 1872" and "Don't burn in silence....... dial 911". Early pre-release screenshot of an FDLC fire truck extinguishing a fire. An FDLC fire fighter in GTA III. A Fire Truck in GTA III. A prop "Rescue" helicopter bearing the FDLC logo at Francis International Airport, GTA III. A Fire Truck in GTA Advance. A "Firetruck" in GTA Liberty City Stories. 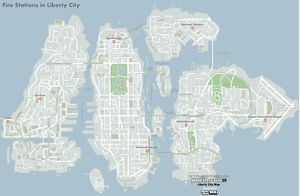 Map of fire stations in Liberty City in GTA IV. 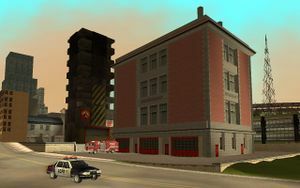 Like in previous games, the Fire Department of Liberty City (FDLC) operates Fire Trucks in their service, and has several stations through out all of Liberty City and Alderney. The motto of the FDLC is "Feel The Burn"; this can be seen in fire houses as well as on all of the FDLC's apparatus. Unlike previous renditions of fire departments, the GTA IV rendition of the FDLC is less responsive towards fire. They do not automatically rush to blazes, and can only be called in using the player's "911" mobile phone call. One of the only notable times the FDLC will respond to a fire is the mission "Rigged to Blow". In addition to regular fire fighter NPC models, there exists a set of fire chief models which are meant to appear within fire houses, dressed in more formal attire and donning a "Chief" jacket. However, fire chiefs rarely, if ever, appear. Dillion Street, Rotterdam Hill, Broker (GTA IV), also known as the "Broker Fire Dept.". Francis International Airport, Dukes (GTA IV). Caterpillar Street, Northern Gardens, Bohan (GTA IV), also known as "Ladder 69". Exeter Avenue (between Boleyn Street), Northwood, Algonquin (GTA IV). The old firehouse is based on the decomissioned Engine Company No. 36 in Harlem, Manhattan. 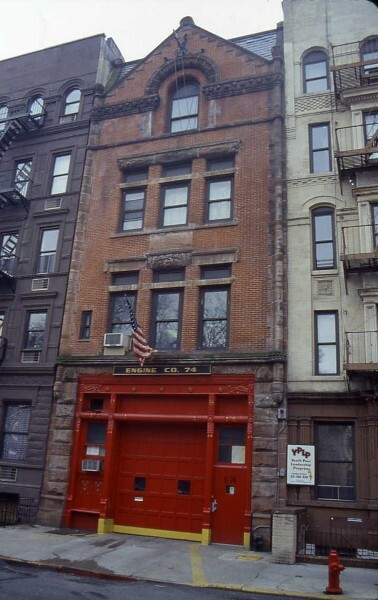 Due to a near identical design, the firehouse can be confused with Engine Company No. 74 further southwest in the Upper West Side. Frankfort Avenue, Westminster, Algonquin (GTA IV), also known as "Engine 47" (unmarked on map). As hinted by its station number, the building is a replica of the real-life Engine Company No. 47 in Morningside Heights, Manhattan. Privateer Road, Fishmarket South, Algonquin (GTA IV). Vitullo Avenue, Berchem, Alderney (GTA IV), also known as "Engine Company No 1" and "Engine Company No 2". The firehouse is based on Engine Company No. 2 in Hoboken, New Jersey. Hardtack Avenue, Tudor, Alderney (GTA IV). Note that in GTA IV, the only fire stations that have a parked fire truck outside the station are those in Bohan, Algonquin (with the exception of the Westminster firehouse) and Alderney. FDLC firefighters in GTA IV. FDLC firefighters with a fire "chief" in GTA IV. An FDLC "chief" in GTA IV, as viewed in a model viewer. A Fire Truck in GTA IV. A Fire Truck in GTA Chinatown Wars.